Tennessee hit the practice field on Thursday afternoon for the 14th and final time of the spring ahead of Saturday’s Orange & White Game. 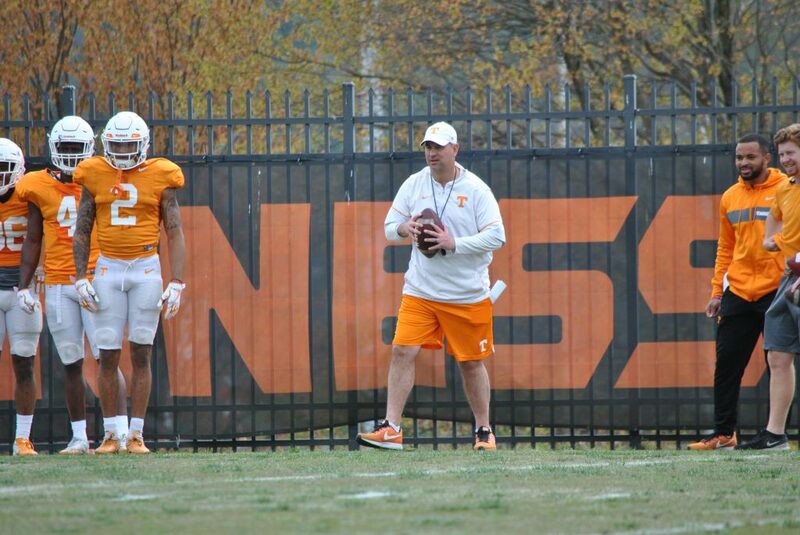 The theme of the spring was fundamentals, and that remained the same during the final practice. UT’s offensive line began practice the same way they have all spring. The first team unit ran under a chute as it straddled a board. Wanya Morris worked at left tackle, Jahmir Johnson at left guard, Ryan Johnson at center, K’Rojhn Calbert at right guard, and Marcus Tatum at right tackle. As for the second team unit, from left to right, it was Nathan Niehaus, Chris Akporoghene, Jerome Carvin, Riley Locklear, and Trey Smith. After working with the chute, the O-line worked with the sleds as a tackle and guard paired up. For the first time this spring, the quarterbacks and wide receivers worked on just one route during the open portion. That route was the fade route in the back of the end zone. Jarrett Guarantano looked the best out of the quarterbacks, as expected. JT Shrout and Brian Maurer made some nice throws, but at times they both struggled to keep the football in bounds. Before teaming up, the quarterbacks worked on the read-option with the running backs while the wide receivers focused on breaking back to the football at the top of their route. They the wideouts focused on high-pointing the football. The tight ends once again did not a catch a football in the open portion of practice. The media never got to see the tight ends go through pass catching drills through the entirety of the spring. Brian Niedermeyer worked them through several blocking drills as they worked on chipping the defensive end and then getting to the next level of the defense. Defensively, each unit rotated fundamental drills during the two periods. Each group began by working on stripping the football. The defensive backs stripped ball carriers while the defensive line and linebackers came off the edge and imitated sacking the quarterback as they knocked the football out. The defensive backs also worked on coming out of their backpedal and working back toward the football and the inside linebackers worked on gaining depth in coverage, their footwork, and striking a blocker. Senior cornerback Baylen Buchanan was once again limited as he has been pretty much all spring.